Experience a fresh Florida escape at SpringHill Suites Orlando at SeaWorld . From families searching for fun to business travelers desiring a well-connected stay, all will find a refreshing retreat at our Orlando hotel. Located near popular theme parks and attractions, our hotel offers exclusive benefits such as free shuttle service to all SeaWorld parks, free quick queue and special shopping and dining discounts. 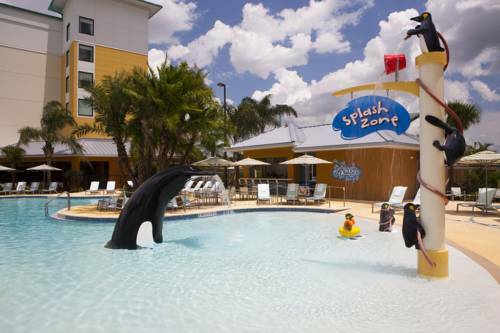 As one of the top kid-friendly hotels in Orlando, we also feature a game room, outdoor Shamu pool and Splash Zone, complemented by Splash Bar & Grill for the adults. Active travelers will appreciate our vibrant gym with state-of-the-art cardio equipment. Upon retiring to your sophisticated suite, kick back on the couch, connect to complimentary wireless internet access and easily enjoy a snack with your in-room microwave and mini-refrigerator. No matter the season, book a successful stay at SpringHill Suites Orlando at SeaWorld and come make memories that will last a lifetime. Well-known gravity hill, prominently marked for your uphill-rolling entertainment.